in this section, photos from four towns are presented, hameln, hoexter, lemgo and schmalenberg, which are situated in the eastern part of westfalen, at or near to the river weser. these towns have two distinctive features - they were flourishing trade places in medieval and early modern times, and timber-framing architecture was a strong facet. 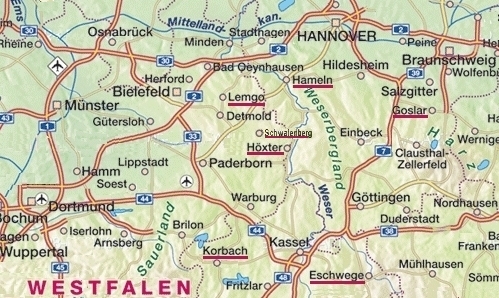 (in this region, customary house-building is also true for eschwege, goslar, korbach, schmalenberg; see map). for both reasons hameln, hoexter and lemgo excel in historic architecture. these three were member of the "hansa", the hanseatic league, a european trading confederation which prospered from the 13th to the 17th century. the little town schmalenberg was too small for the hansa, yet also stands out in colourful wooden houses. most buildings survived world-war 2, and are now part of the heritage status of these impressive townships.